The Pacifica Quartet, the University’s former ensemble-in-residence, concluded its residency with a concert on campus last Sunday. The year was 1999. 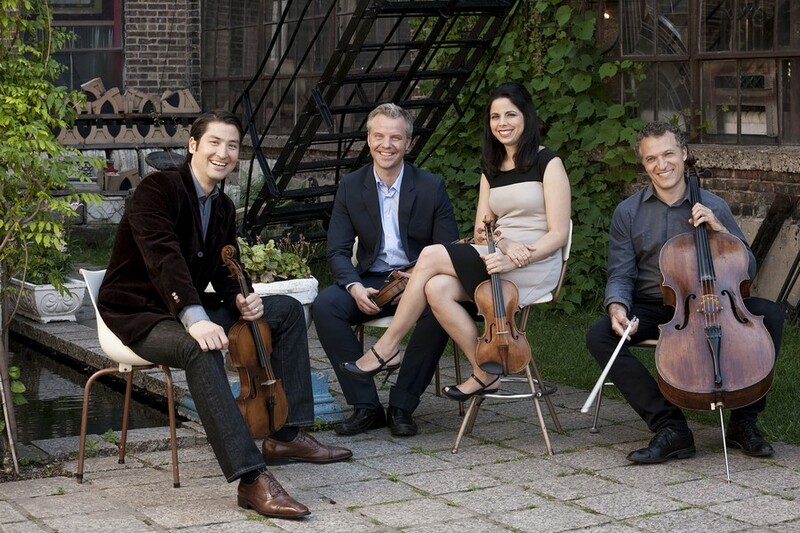 The Pacifica Quartet had recently moved from Los Angeles—the group’s namesake—to Chicago. Brought together by celebrated pedagogues Roland and Almita Vamos (who taught violinists Simin Ganatra and Sigurbjorn Bernhardsson at Oberlin, and whose son, Brandon, was the quartet’s cellist), the newly-minted quartet was teaching alongside the Vamoses at the Music Center of the North Shore, now the Music Institute of Chicago. Then, somewhat on a whim, the quartet reached out to the University of Chicago. “We made a cold call and sent a recent recording of Bartók’s String Quartet No. 5,” first violinist Simin Ganatra recalled. Their recording happened to land in the hands of professor of composition Shumalit Ran. She liked what she heard and shortly thereafter, the Pacifica Quartet became ensemble-in-residence at the University. What began as “a one-year experiment”—as Ran would quip later—turned into a distinction the quartet would maintain for 17 years. Since then, Pacifica has grown into one of the classical world’s most celebrated quartets. After cementing its current configuration (with Masumi Per Rostad on viola) in 2001, the group went on to win the prestigious Avery Fisher Grant, a Grammy, and Musical America’s Ensemble of the Year Award. Pacifica was named the Quartet-in-Residence of both the Metropolitan Museum of Art and the Jacobs School of Music at Indiana University in 2009, and the first Don Michael Randel Ensemble-in-Residence at the University of Chicago in 2013. Earlier this year, it was announced that Imani Winds—a New York-based woodwind quintet—will succeed Pacifica as the University’s next Don Michael Randel Ensemble-in-Residence at the end of this academic year. Though the quartet returns next year under the auspices of the on-campus concert series UChicago Presents, its April 24 performance at the Logan Center formally capped off its long and distinguished residency at the University, which has encompassed master classes, world premieres, and many, many performances. The quartet credits its steady diet of “music being written right now” as particularly formative. While in residency at the University, Pacifica played as part of Contempo, the University’s resident contemporary music collective, of which Shumalit Ran served as artistic director from 2002 until her retirement last year. When asked what moments stand out from their residency, the quartet cited musical memories, like the conclusion of its Shostakovich and Elliott Carter quartet cycles or workshopping new pieces with Ran and Contempo. But many memories were personal. For example, after the quartet moved from Chicago to Champaign in 2003, Rostad fondly recalled being taken in by late sociologist and former Dean of the College Don Levine, who died last year. Levine’s family “adopted” Rostad, giving him a home away from home. Vamos shared a story about a former student he’d taught while giving cello lessons through the University. The common denominator throughout has been the enthusiasm of University audiences—Pacifica’s “best audience,” according to Ganatra. And what gratitude there was: at the conclusion of Beethoven’s String Quartet No. 14 (Op. 131), Pacifica was greeted with a lengthy standing ovation. Though the program had been selected before the news of its departure broke, no better piece could be chosen to conclude Pacifica’s time at UChicago: Beethoven himself wrote it as a gesture of gratitude to his friend, and he considered it the greatest of his late quartets. “Opus 131 is considered by many musicians the greatest piece ever written, so it seemed like a fitting end to the season, and now a fitting end to our residency,” Bernhardsson said. After Bernhardsson thanked the audience (many of whom rejoined with hearty “No, thank yous!”), the quartet returned to the stage to play an encore: the expansive Lento from Beethoven’s last string quartet, his No. 16 (Op. 135). As the quartet’s sweeping lines washed over the Performance Hall, one could hardly imagine a sweeter send-off. Editor's Note: Hannah Edgar works for UChicago Presents, the concert series which arranges the Pacifica Quartet's on-campus concerts.